This article is about the film. 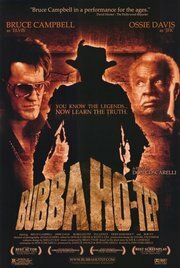 For the novella it is based on, see Bubba Ho-Tep (novella). Bubba Ho-Tep is a 2002 American comedy horror film written, co-produced and directed by Don Coscarelli. It stars Bruce Campbell as Elvis Presley—now a resident in a nursing home. The film also stars Ossie Davis as Jack, a black man who claims to be John F. Kennedy, explaining that he was patched up after the assassination, dyed black, and abandoned. It is based on novella of the same name by Joe R. Lansdale, which originally appeared in the anthology The King Is Dead: Tales of Elvis Post-Mortem. Originally the film was "roadshowed" by the director across the country. Only 32 prints were made and circulated around various film festivals, though these garnered critical success. By the time it was released on DVD, it had already achieved cult status due to positive reviews, lack of access, and inclusion of (and similar on-the-road hard work by) Campbell. While the novella and film revolve around an ancient Egyptian mummy (played by Bob Ivy) terrorizing a retirement home, Bubba Ho-tep also deals with the deeper theme of aging and growing old in a culture that values only the young. The film also features a cameo by Reggie Bannister from Coscarelli's Phantasm series. An elderly man (Bruce Campbell) at The Shady Rest Retirement Home in East Texas is known to the staff as Sebastian Haff, but claims to be the real Elvis Presley. He explains that during the 1970s, he grew tired of the demands of his fame and switched places with an Elvis impersonator named Sebastian Haff (also Campbell). He claims it was Haff who eventually died in 1977, while he, the real Elvis, lived in quiet, happy anonymity and made a living pretending to be himself. After a propane explosion destroyed documentation which was the only proof that he was actually Elvis, he was unable to return to his old lifestyle. A hip injury during a performance causes him to get an infection and slip into a coma. Twenty years later and living at the retirement home as the film opens, he is contemplating his age, frailty, loss of dignity, impotence, and "A growth on [his] pecker". Elvis's only friend is a black man named Jack (Ossie Davis) who insists he is President John F. Kennedy, claiming to have been dyed black after an assassination attempt, and abandoned by Lyndon Johnson in a nursing home. Initially skeptical of Jack's story, Elvis does spot a mysterious scar on the back of Jack's head. It could be from the head wound seen in the Zapruder film, but then it might not be. Eventually, Elvis and Jack face off against a re-animated ancient Egyptian mummy that was stolen during a U.S. museum tour, and then lost during a severe storm in East Texas when the thieves' bus veered into a river near the nursing home. The mummy strangely takes on the garb of a cowboy and feeds on the souls of the residents of the home. It is dubbed 'Bubba Ho-Tep' by Elvis, who is given a telepathic flashback of the mummy's life and death when he looks into its eyes. The slow, plodding mummy is a real and credible threat, as instead of going against young adults who could potentially outrun or overpower it, the mummy gives chase to the elderly. Jack and Elvis lack mobility and need a motorized wheelchair and a walker to get around the grounds. Elvis and Jack create an elaborate plan to destroy the mummy. Destruction of the mummy would release the trapped souls of their dead friends, and they would be able to go to their final resting place. Elvis and Jack battle the mummy in the middle of the night, with Jack in an electric wheelchair and Elvis wielding a makeshift flamethrower. Jack is knocked out of his wheelchair by the mummy and is about to have his soul sucked. Elvis hops in the wheelchair, zooms into the mummy to save Jack, and damages the flamethrower, getting a large gash in his abdomen in the process. Jack dies from a heart attack. Elvis becomes committed to getting rid of the mummy, and he throws the gasoline on him and then throws matches at him, killing the mummy. Elvis lies on a hill near the river bank, dying from the blood loss from the gash and broken ribs. He talks in his mind about how he doesn't fear death, knowing that he still had his soul and that he saved all of the fellow people at the Shady Rest Retirement Home. As he reflects upon this, the stars align into a message for Elvis, saying: "all is well". With a dying "Thank you, thank you very much", Elvis passes away. Many of Bubba Ho-tep's crew also worked on the films in Coscarelli's Phantasm series. Several actors from the series also have small roles including Heidi Marnhout, Bob Ivy, and Reggie Bannister. Coscarelli kept much of the original short story's exposition, but had some difficulty trying to "integrate Elvis' voice". Review aggregator Rotten Tomatoes reports a rating of 79% based on 107 reviews, and an average of 6.8/10. The site's consensus was a tongue-in-cheek statement, "The best movie to star both the King and JFK." Metacritic gives it a weighted average rating of 57/100 based on 28 reviews, indicating "mixed or average reviews". Peter Travers of Rolling Stone gave the film three out of four stars saying, "This absurdly clever caper is elevated by Bruce Campbell's pensive Elvis into a moving meditation on the diminutions of age and the vagaries of fame." Todd McCarthy of Variety gave a negative review stating, "[The] introduction of the mummy plot basically derails the film at about the 45-minute point, and the silly climax...is so rote and generic that it could have come out of any ordinary horror film. ", although McCarthy does admit, "Campbell's Elvis stands as one of the very best screen interpretations of the King seen thus far, even if he's arguably not even playing the real thing." Roger Ebert of the Chicago Sun-Times gave the film three out of four stars and highlighted the film's "delightful wackiness" and stating, "It has the damnedest ingratiating way of making us sit there and grin at its harebrained audacity, laugh at its outhouse humor, and be somewhat moved (not deeply, but somewhat) at the poignancy of these two old men and their situation." Initially Coscarelli never intended to create a sequel to Bubba Ho-Tep, as the end credits announcement of a second film entitled Bubba Nosferatu: Curse of the She-Vampires was meant to be seen as a joke. He eventually changed his mind about this after seeing the positive reception for the first film and after several people inquired about when the sequel would release. The sequel would center around the production of a 'lost' Elvis movie from the 1950s or 1960s, and would bring in Paul Giamatti as Colonel Tom Parker. In 2007 Bruce Campbell reported that he was no longer involved in the sequel, as he and Coscarelli had "a few points [developing the screenplay] that we couldn't reconcile" and that he parted ways with the project as a way of keeping his friendship with the director. The project was briefly reported as "dead" by Joe Lansdale in February 2008, but later that same year Giamatti asserted that the film was still alive and that Ron Perlman was interested in taking over the role of Elvis. Due to the amount of time that had passed since the release of Bubba Ho-Tep, Coscarelli and Giamatti had trouble raising funding for the film and the movie went back into development hell. However Giamatti reported that they were still trying to get the film made and that they had plans to create a franchise that would include plot lines such as Elvis battling aliens. As of 2013 Giamatti has confirmed that a script has been written and that it was "really great", and that he hoped that they would be able to eventually make the film. In 2018, IDW Publishing released a five-issue limited series prequel, Bubba Ho-Tep and the Cosmic Blood-Suckers. The series was supervised by Lansdale, written by Joshua Jabcuga, and illustrated by Tadd Galusha. In 2019, Dynamite Entertainment will launch a crossover miniseries, Army of Darkness/Bubba Ho-Tep, seeing Elvis team up with another Bruce Campbell character, Ash Williams. ^ "Quint on BUBBA HO-TEP + Interview with Coscarelli, Bruce Campbell and Joe Lansdale!!!". AICN. Retrieved 9 January 2014. ^ McCarthy, Todd (2002-06-26). "Bubba Ho-Tep". Variety. Retrieved 2010-11-20. ^ Ebert, Roger (2003-10-17). "Bubba Ho-Tep". Chicago Sun-Times. Retrieved 2010-11-21. ^ a b Paszylk, Bartlomiej (2009). The Pleasure and Pain of Cult Horror Films: An Historical Survey. McFarland. p. 208. ISBN 0786436956. ^ Bartyzel, Monika (2007-08-28). "Bruce Campbell Won't Do 'Bubba Nosferatu'". Moviefone. Retrieved 2010-11-21. ^ Crider, Bill (2008-02-25). "Joe Lansdale Update". Bill Crider's Pop Culture Magazine. Retrieved 2008-05-26. ^ Vespe, Eric (2008-10-30). "AICN Exclusive: Hear who is filling Elvis' jumpsuit in 'Bubba Nosferatu' from the mouth of Col. Parker himself, Mr. Paul Giamatti!". Ain't It Cool News. Retrieved 2010-11-21. ^ a b Wigler, Josh. "'Bubba Nosferatu' Could Become 'Bubba Roswell,' Paul Giamatti Reveals". MTV. Retrieved 8 January 2014. ^ Wigler, Josh. "EXCLUSIVE: Paul Giamatti Says 'Bubba Nosferatu' Will Come Together, Despite Financial Setbacks". MTV. Retrieved 8 January 2014. ^ Radish, Christina. "Paul Giamatti Talks JOHN DIES AT THE END, the HBO Movie K BLOWS TOP, BUBBA NOSFERATU, and Steve McQueen's TWELVE YEARS A SLAVE". Collider. Retrieved 8 January 2014. This page was last edited on 1 February 2019, at 17:45 (UTC).